If you are not following particle physics news or blog sites, you might have missed the big excitement last month when it was announced that the Large Hadron Collider may have observed a new particle with a mass of 750 GeV (roughly 800 times as heavy as a hydrogen atom). Most of these papers are almost certainly wrong. Indeed, there is a chance that all of them are wrong, on account of the possibility that there is no 750 GeV resonance in the first place. I am looking at two recent papers. One, by Buckley, discusses what we can (or cannot) learn from the data that have been collected so far. Buckley cautions researchers not to divine more from the data than what it actually reveals. He also remarks on the fact that the observational results of the two main detectors of the LHC, ATLAS and CMS, are somewhat in tension with one another. From Fig. 2: Best fit regions (1 and 2σ) of a spin-0 mediator decaying to diphotons, as a function of mediator mass and 13 TeV cross section, assuming mediator couplings to gluons and narrow mediator width. 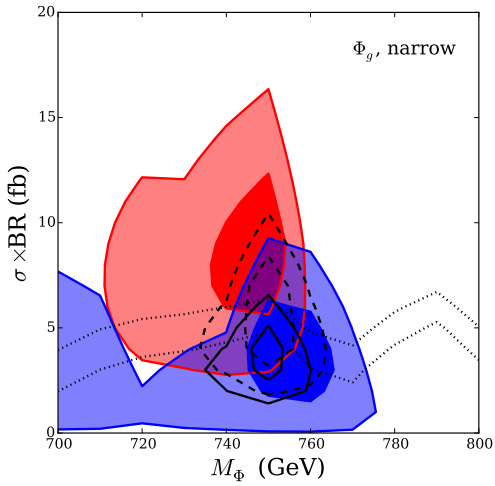 Red regions are the 1 and 2σ best-fit regions for the Atlas13 data, blue is the fit to Cms13 data. The combined best fit for both Atlas13 and Cms13 (Combo13) are the regions outlined in black dashed lines. The best-fit signal combination of all four data sets (Combo) is the black solid regions. The other paper, by Davis et al., is more worrisome. It questions the dependence of the presumed discovery on a crucial part of the analysis: the computation or simulation of background events. The types of reactions that the LHC detects happen all the time when protons collide; a new particle is discerned when it produce some excess events over that background. Therefore, in order to tell if there is indeed a new particle, precise knowledge of the background is of paramount importance. 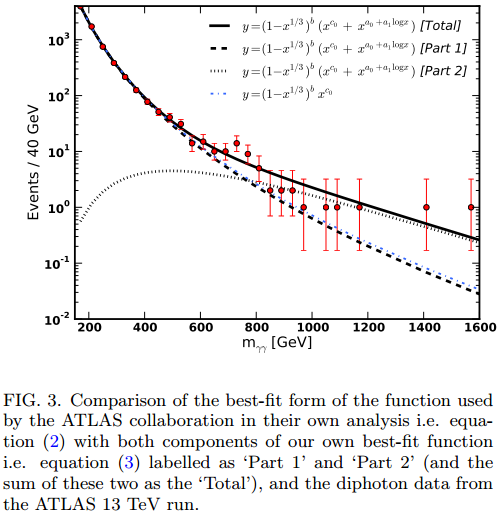 Yet Davis and his coauthors point out that the background used in the LHC data analysis is by no means an unambiguous, unique choice and that when they choose another, seemingly even more reasonable background, the statistical significance of the 750 GeV bump is greatly diminished. I guess we will know more in a few months when the LHC is restarted and more data are collected. It also remains to be seen if the LHC can reproduce the Higgs discovery at its current, 13 TeV operating energy; if it does not, if the Higgs discovery turns out to be a statistical fluke, we may witness one of the biggest embarrassments in the modern history of particle physics.